I keep seeing posts stating that charcoal is expensive. I have been at this for a year and a half and haven't bought a lump of charcoal yet. I am able to get pallets free and make my own. I understand if you live in an urban area there are regulations on open burning. Wood burning stoves and fireplaces are a source of charcoal. If you don't have one you probably know someone who does. I took some quarter inch screen and made a sieve to sift the ashes out. Maybe this will be of use to some maybe not. Some more thoughts. I had just about given up on hardwood charcoal. I used it with a bottom blast with good results except for how much I used. Since going to a side blast not so much. Too muddy to cut wood this morning so I fired up the forge. I was cranking along without a lot of heat, then Glenn's words hit me "air makes the fire hotter". Cranked a little faster and there it was. Now with the pallets I am able to get, and the coals I save from the stove, I don't see having a fuel problem. The next step is to cut the pallet slats into 3 to 4 inch lengths and add those directly to an existing fire. Depth of the wood depends on how quickly the wood burns and turns into charcoal, and that charcoal is used for fuel and heat. As you play with it you may want to build a metal circle (large tin can or pipe) to hold the wood above the fire. This will allow you to hold a larger quantity of wood to convert to charcoal, without the wood spreading out all over the forge. This'll also help prevent you being roasted by the flames. In years past I did a lot of campfire smithing and radiant heat from the fire was the main limiting factor. I ended up scrounging whatever was available for heat shields and even then it could become unbearable. Thanks for the tips. Right now I have a 80 bushel hog feeder about 90 percent full of charcoal I have made from pallets and stove screenings. The container above the fire is interesting. Some of the volatiles would probably start cooking off? 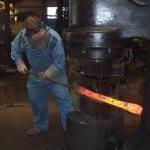 I can see campfire forging getting pretty warm, definitely want to do that in the winter. I built a shovel out of gravel shaker screen so I can "mine" charcoal from a fire, give it a shale to get rid of ash and "fines" and dump it in my forge upwind and out of "baking" range of the donor fire.